Author Victoria James offers hope for peace and acceptance to victims of abuse in new book. I’m just a survivor who wants to offer hope for victims out there that the cycle of abuse can be broken. Life can be better with love and faith. As a survivor herself of childhood abuse, author Victoria James knows the need for hope, charity and kindness. 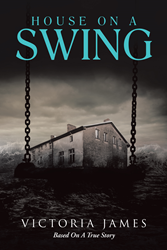 Her new book, House on a Swing, provides insight into overcoming abuse and rising above the past. In House on a Swing, James shares the inspiring story of Lizzie, a victim of childhood abuse who suffers at the hands of those she loves and ultimately breaks the cycle of abuse after finding love. Lizzie’s story is inspired by that of James’ own life. Although many well-known people, including Vice President Joe Biden, Lady Gaga, and Oprah Winfrey, have shared their stories of abuse, offered support for victims and spoken out against abuse, many victims are at a loss for where to find the support and hope they need to build successful, happy lives for themselves. For more information, visit http://www.houseonaswing.com. Victoria James lives in Lafayette, Indiana and is the area director of sales and marketing for Marriott Hotels. She is a member of the Church of Jesus Christ of Latter-day Saints and Kiwanis and is happily married.